Not all of the gems along Monticello Road are hidden. In fact, one of them is so visible that it causes people to exit the nearby interstate to investigate. 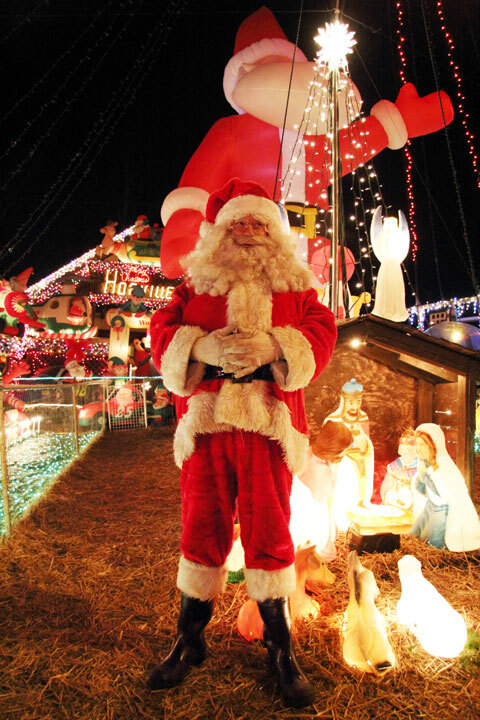 On evenings in December, there is a steady stream of cars and families rolling up to visit Santa or to stroll wonder-struck through his amazing menagerie of lights and inflatables. It's really unparalleled, though his neighbor bids fair with his own over-the-top holiday decorations. (see Ross McDermott's excellent documentary on the mostly-friendly rivalry). It's a cool place to hang out--quite litterally so. The Santa/proprietor (who's known as Jeff during the rest of the year) attributes his compound's noticably chilly temperature to the scores of fans needed to keep the blow-ups inflated. I suspect there might also be some North Pole magic involved as well. It isn't sorcery that illuminates the thousands of bulbs or keeps those fans blowing however. Jeff spends thousands of dollars of his own cash (plus the pittance in his tip jar). That--and the incredible time he puts in--is his holiday gift to the world, freely given. So that slight chill you feel does come from the spirit of Christmas in a very real way--along with the peppermint candy cane he hands you on your way out. Jeff's holiday menagerie is located at the bottom of the Monticello Road, behind the gas station--close to I-64.